When I moved to Maryland in 1980 I heard about the annual Chesapeake Bay Bridge walk, across the four mile bridge between Annapolis and Kent Island, MD, and I wanted to do it. 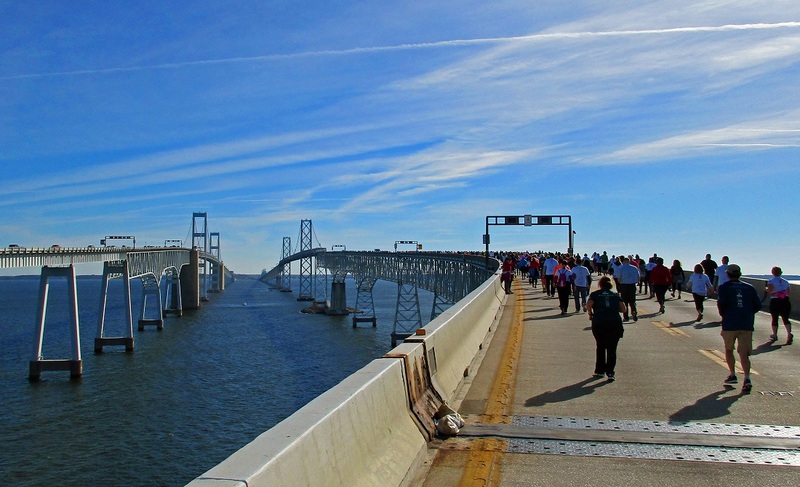 Every spring, one Sunday early in May, the older span of the bridge that spans the Bay and connects the DC and Baltimore population to Maryland's eastern shore beach resorts was closed to traffic and open to walkers. It was free. All you did was show up and find a place to park or get dropped off at Sandy Point State Park ... and walk. They offered a free school bus shuttle back to your vehicle. It was a huge party. Tens of thousands of walkers did it every year. As I said, I wanted to do it; but I kept putting it off. Walking was not my major form of exercise back then. I had better things to do with my time. Always some excuse. Then one spring, some time in the late 1980's or early 90's they cancelled the walk due to construction or other problems. The bridge authority seemed to like not having to deal with this major logistical hassle. The event was cancelled again the following year. And every year after that. Eventually they stopped even bothering to announce the cancellation. It was the end of an era. I had missed my chance. Then in 2014 came a reincarnation of the event in a new form. 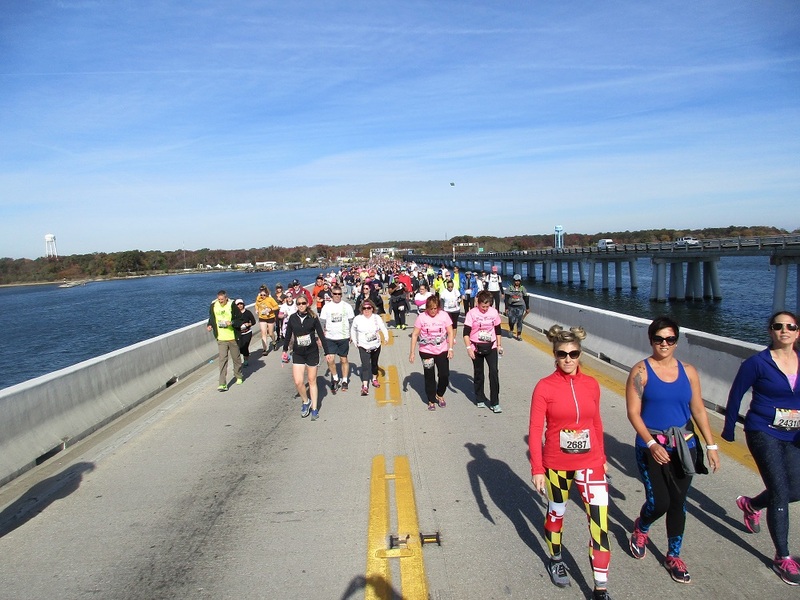 The 'Ten K Across the Bay' Bridge Race was born. The bridge authorities probably liked this controlled event much better. You had to pay a pretty steep entry fee. Sixty smackers. The private, for-profit race organizers took over the logistics from the bridge authority, recruiting volunteers, arranging parking, shuttle buses, etc. The people who did the walk had to register and wear a number. Much less messy for law enforcement and emergency services. They had to announce their expected time. They are warned that if they can't keep a minimum pace they will be picked up by a 'sag wagon'. No all-day dilly-dallying on the span. They would be a fit and driven crowd. And therefore a smaller crowd. They would be off the bridge by early afternoon. By the time this resurrection took place, I had all but given up hope of walking across the Bay Bridge. Too bad, too, because now I was an avid long distance hiker. Specifically a continuous foot-trail hiker, and the route of the American Discovery Trail (ADT) uses that bridge. The American Discovery Trail isn't my favorite trail. It is discontinuous in three places. The Bay Bridge is the first. The other two are not 'correctible'. The trail route uses ferry boats to cross the Ohio River at Cincinnati and again across San Francisco Bay. Worse, the ADT has far too much mileage on roads and paved rail trails and not enough dedicated footpath, tramping the good natural earth. In fact they seem to consider foot-only travel an annoyance, because their turn-by-turn directions always give a road (bicycle) alternative to the foot-only sections. No, not my kind of trail. But I need to hike from the east coast to Colorado. It's the goal of my 'Personal Continuous Footpath' (PCF) to hike to every place where I have ever lived, to set down a continuous string of footprints connecting them. I lived in Colorado from 1970 to 1980. It's the farthest west I need to hike to fulfill the PCF goal. And the ADT is the only continuous 'named trail' that crosses the US great plains. There is a new option in Canada. It's the most impressive trail in the world. The 'Great Trail' also called the Trans-Canada Trail, which runs 15,000 miles through every province of that vast country. But Canada is pretty far out of my way. The ADT, on the other hand, goes right through Colorado. It even has two separate routes across the great plains to get there. So if I want to stay on any sort of official trail, I'm pretty much stuck with the ADT. Even so, I would have to find an alternative route through SW Ohio to avoid that ferry. No problem there. Just pick a road route. 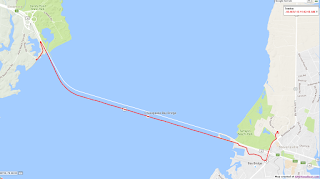 And now the gap across the Chesapeake Bay Bridge can be walked again, though only once a year, and only if I'm fit enough to do it at a pace of at least three miles per hour. Well I'm still young enough to do that. In fact I ended up doing the 10K in 1:45, closer to 3½ mph. It was a beautiful day. I reached the staging area about 9AM. I was set to start with the very last wave, the slowest. Our wave assembled at the start line at 9:30AM. 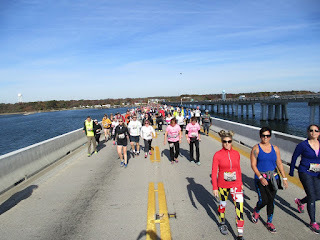 Runners had been crossing the bridge since sunrise. The race is advertised as the fifth largest 10K in the US. I was crossing the bridge with 22,000 of my closest friends. The views of the bridge and the bay were spectacular on this bright, breezy, cool early November Sunday. The organizers had everything covered. There was a port-a-potty every half mile on the bridge. Emergency vehicles stationed every mile. And enthusiastic staff stood ready to help and to cheer you on. In all, from leaving home to returning, it was an eight hour adventure to do six miles of hiking. A lot of driving, bus riding, and just waiting in lines. Here is my GPS track of the race route. Now all I have to do is hike the gap, almost all on roads, to Cape Henlopen State park on the Atlantic Ocean, where I've already hiked the eastern few miles of the ADT, and then make a short connection from the west side of the Bay Bridge to BWI Airport where I pick up already completed sections of my PCF. That completed section stretches south to Key West, FL, North on the Appalachian trail to Maine, and now west almost to Ohio on the North Country Trail. Keep following this blog. I'll be working my way steadily to Colorado, "God willin' an' the crick don't rise."